Bilateral trade between India and Pakistan touched USD 2.6 billion in 2012-13, an increase of 34.4 per cent over last year's USD 1.94 billion. Pakistan would grant India the status of Non-Discriminatory Market Access (NDMA) to facilitate enhanced bilateral trade, Commerce Minister Khurram Dastigir Khan has said. “It is not MFN (Most Favoured Nation) but we call it NDMA which calls for non-discriminatory and parallel market access,” the Dawn on Friday quoted Khan as saying. Talking to media after addressing members of Hyderabad Chamber of Commerce and Industry (HCCI), Khan described Prime Minister Nawaz Sharif’s visit to India this week as positive and said Sharif did not indulge in reactionary diplomacy. Khan said although Pakistan has certain reservations with India like Kashmir, Siachen, Afghanistan, Sir Creek and water issues, “mere handing over list of reservations is not diplomacy”. 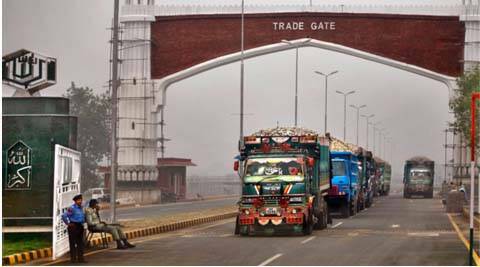 Bilateral trade between India and Pakistan touched USD 2.6 billion in 2012-13, an increase of 34.4 per cent over last year’s USD 1.94 billion. Various sections in Pakistan, especially the extreme right wing, had objected to the term “Most Favoured” being given to India because of the history of issues between the two sides. India had already granted MFN status to Pakistan in 1996. Earlier, addressing HCCI members, Khan said Pakistan’s energy crisis would be overcome to a great extent by 2016. Government is planning to take energy production to 40,000 megawatts and it is trying to switch over to coal-based power from furnace oil. Separately, speaking at a gathering of growers arranged by Sindh Abadgar Board in Hyderabad, he said that India with other regional markets can boost exports of the country. “We shouldn’t be apprehensive of India’s products and markets. Positive list has been replaced with negative list in PPP government and barring a few things all kind of trade with India is open since 2012. “Besides India, countries like Iran, Afghanistan and Gulf region are attractive markets waiting our products. We can make better returns but we must first organise ourselves,” he said. Referring to North America Free Trade Agreement and Association of Southeast Asian Nation, Khan said Pakistan’s economy would struggle to grow if it remains confined to its borders.